Many health and budget policy issues in Tennessee require a firm understanding of Medicaid and TennCare. 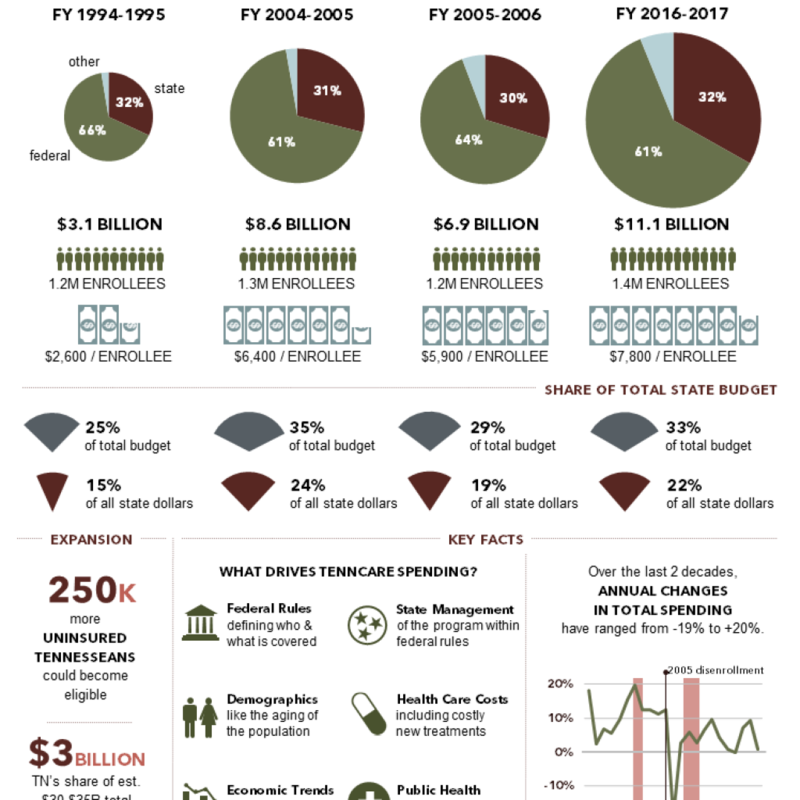 This policy primer explains Medicaid and TennCare’s goals, histories, functions, structures, funding, and cost drivers. Medicaid is a health insurance program created by the federal government in 1965. Each state runs its own Medicaid program using federal and state money to insure individuals with low incomes and/or disabilities. Broadly speaking, the goals of Medicaid are to provide health insurance, increase access to care, and improve health outcomes for vulnerable populations for whom private coverage is unaffordable or unavailable. The program’s specific goals have evolved over time as new populations and benefits have been added. Each state runs its own Medicaid program according to rules set by the federal government. At a minimum, state programs must provide federally-mandated benefits to certain populations without any limits or wait lists. Federal law also includes optional eligibility categories and optional benefits that states can choose to include or not. States can also apply for federal “waivers” to customize their Medicaid programs without losing federal matching funds. Medicaid is an entitlement. Anyone meeting eligibility criteria is entitled to enroll and receive all covered benefits. As a result, lawmakers do not set a budget for Medicaid spending. Instead, Medicaid spending is determined by how many people enroll and how much their benefits cost. Entitlements are different from discretionary grant programs. Discretionary grants are awarded to states as a fixed amount of funding for some specific purpose. Federal funding for each discretionary grant program — such as a block grant — is capped every year by Congress. Once states spend their discretionary grant funding for the year, no additional federal funds are available even if more need exists or the state spends more of its own funds than required. The federal government pays for a specific portion of Medicaid costs in each state. The portion varies by state and is calculated by the federal medical assistance percentage (FMAP) formula. State-specific FMAPs range from a high of about 75% to a floor of 50%. At 65%, Tennessee’s FMAP was the 17th highest in the country in 2017. (2) Federal contributions under the FMAP are unlimited, and states cover the remaining portion of their Medicaid costs. For Tennessee, that state matching requirement is 35%. The FMAP is more generous for lower-income states and for enrollees made eligible through the ACA’s optional Medicaid expansion. 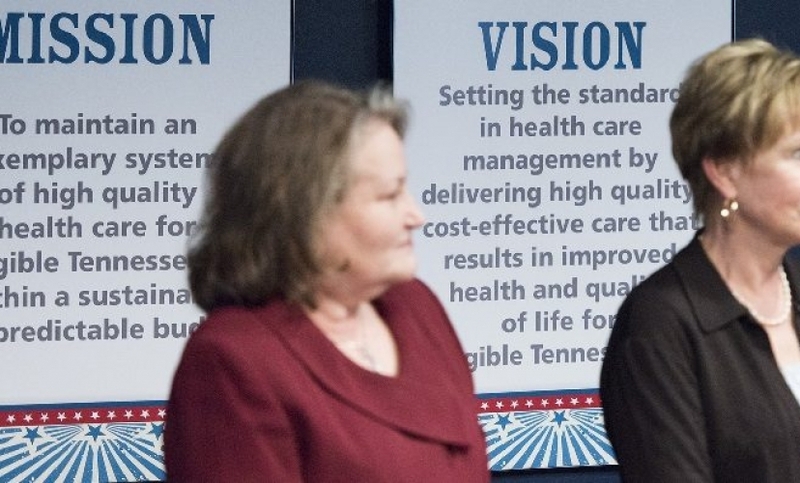 Tennessee’s current Medicaid program is known as TennCare. The program operates under an “1115 waiver,” which allows the state to deviate from some federal Medicaid rules. As a result of the waiver, all TennCare beneficiaries are enrolled in plans administered by private health insurance companies — known as managed care organizations (MCOs). MCOs receive a capitated (a.k.a. lump sum) payment for each enrollee and are responsible for managing enrollees’ costs within those payments. Tennessee is one of only 2 states to enroll every Medicaid enrollee in an MCO. Many states exclude certain populations — for example, people who are eligible for both Medicare and Medicaid. When TennCare launched in January 1994, Tennessee used expected savings from this novel (at the time) approach to expand Medicaid coverage to optional populations. These populations included “uninsurable” individuals and uninsured individuals not otherwise eligible for employer or government insurance. This was considered the most expansive Medicaid eligibility in the country at the time. Overall enrollment was capped at about 1.8 million people. In its first year, TennCare covered over 300,000 additional uninsured individuals who were otherwise not eligible for Medicaid. Many newly-eligible individuals with incomes above the poverty line were required to pay premiums and other cost-sharing measures like copays. 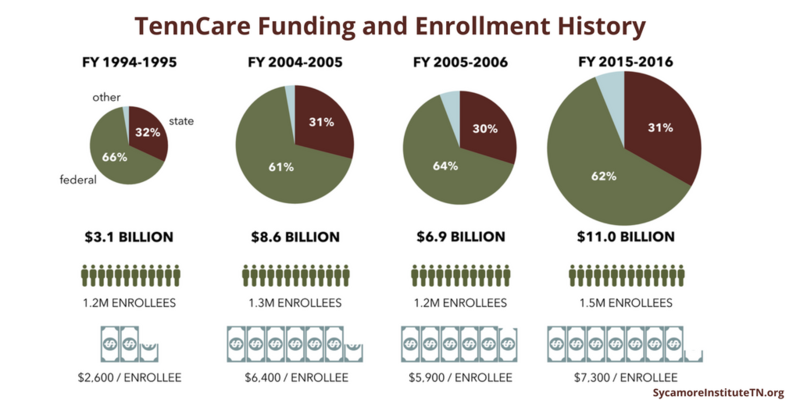 Within a few years, MCOs were losing money on TennCare enrollees. By the early 2000s, rising pharmaceutical and medical care costs created budget shortfalls of hundreds of millions of dollars. Federal funding under the waiver was capped, which contributed to the state’s shortfalls. Policymakers sought to modify eligibility, limit certain benefits, and disenroll some beneficiaries, but legal challenges halted and reversed some of these efforts. Today, TennCare still uses MCOs to administer benefits and primarily serves populations required by federal Medicaid law (low-income children, low-income pregnant women, low-income mothers, and low-income aged, blind, or disabled individuals). Some optional categories are also covered, including certain uninsured children under 19 who would otherwise lose TennCare eligibility. (5) Tennessee has not implemented the ACA’s optional expansion of eligibility to all individuals earning less than 138% of the poverty level. Medicaid waivers are time-limited. The state has to renew its waiver about every 5 years, at which time the federal government can tweak existing requirements or add new ones. In late December 2016, the TennCare waiver was renewed through June 2021. TennCare is the single largest department in the state budget. In FY 2015-2016, it accounted for 33% of total spending from all revenue sources. The program is predominantly funded by federal dollars. In FY 2015-2016, the federal government paid for 62% of total spending on TennCare, which amounted to 55% of all federal dollars flowing into the state. In contrast, 22% of state dollars were spent on TennCare. When considering only spending from state revenues, TennCare was the 2nd largest department behind K-12 Education. TennCare is considered a relatively low-cost, efficient Medicaid program when compared to other states. According to the most recent data available, TennCare’s per enrollee costs are lower than most other states – particularly for children and high-cost enrollees like seniors and individuals with disabilities. Total TennCare spending has been growing (and almost always faster than inflation). TennCare spending per enrollee has been growing with occasional dips. 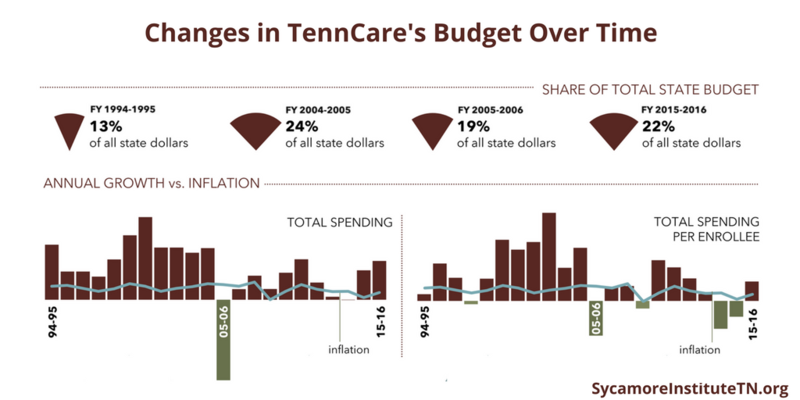 Annual changes in TennCare spending have been volatile (both in total and on a per-enrollee basis)— particularly compared to inflation. 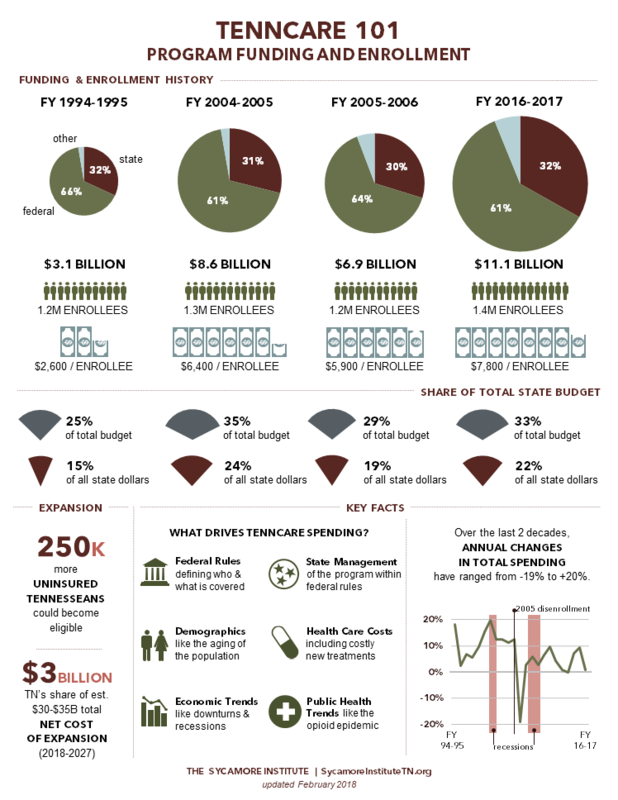 The only drop in total TennCare spending since FY 1994-1995 occurred because lawmakers disenrolled some optional eligibility populations in 2005. Total TennCare spending fell from $8.6 billion to $6.9 billion while enrollment fell from 1.3 million to 1.2 million. TennCare costs tend to spike during economic downturns when more individuals meet the program’s income eligibility standards. In FY 2008‑2009 in the midst of the Great Recession, TennCare enrollment jumped by 4%. At the time, it was the program’s largest annual enrollment increase in a decade. TennCare costs can be unpredictable because Medicaid is an entitlement program. Coverage of many treatments is guaranteed to all who are eligible — even when treatment costs or the number of enrollees spike. This structure ensures that all low-income, aged, and disabled adults and children meeting eligibility criteria are guaranteed access to TennCare’s coverage of needed health care services. The trade-off, however, is that states are often required to cover these costs without exception. This makes states’ costs relatively unpredictable and arguably impacts other parts of a state’s budget. However, the federal government picks up the lion’s share of this bill for Tennessee, which partially shields the state from unpredictable cost spikes. *This brief was updated on Dec. 12, 2017 to correct data errors in the TennCare historical funding graphic. Kaiser Family Foundation. Medicaid Timeline. [Online] March 24, 2015. http://kff.org/medicaid/timeline/medicaid-timeline/. —. Federal Medical Assistance Percentage for Medicaid and Multiplier – FY 2017. [Online] 2017. http://kff.org/medicaid/state-indicator/federal-matching-rate-and-multiplier/. Aizer, Anna, Gold, Marsha and Schoen, Cathy. Managed Care and Low-Income Populations: Four Years’ Experience with TennCare. Kaiser Family Foundation. [Online] September 1, 1999. https://kaiserfamilyfoundation.files.wordpress.com/1999/08/mcli899.pdf. Chang, Cyril and Steinberg, Stephanie. TennCare Timeline: Major Events and Milestones from 1992 to 2016. University of Memphis Methodist Le Bonheur Center for Healthcare Economics. [Online] September 2016. http://www.memphis.edu/mlche/pdfs/tenncare/tenncare_bulleted_timeline.pdf. TennCare Division of Health Care Finance & Administration. Major Medicaid Eligibility Categories in Tennessee. [Online] 2016. https://www.tn.gov/tenncare/article/categories. Kaiser Family Foundation. “Data Note: Variation in Per Enrollee Medicaid Spending Across States.” [Online] February 2017. http://files.kff.org/attachment/Data-Note-Variation-in-Per-Enrollee-Medicaid-Spending-Across-States. Chahal, Harinder, Marseille, Elliot and Tice, Jeffrey. Cost-Effectiveness of Early Treatment of Hepatitis C Virus Genotype 1 by Stage of Liver Fibrosis in a US Treatment-Naive Population. Journal of the American Medical Association Internal Medicine. [Online] January 2016. http://jamanetwork.com/journals/jamainternalmedicine/article-abstract/2471608. Felsted, Sterling and Nibert, Dawna. Actuarial Review of the TennCare Program: Development of State Fiscal Year 2015 Per Member Costs. Aon Hewitt Consulting. [Online] February 2, 2015. https://tn.gov/assets/entities/tenncare/attachments/actuarial15.pdf. Tennessee Division of Health Care Finance & Administration. Neonatal Abstinence Syndrome among TennCare Enrollees – 2014 Data. [Online] January 14, 2016. https://www.tn.gov/assets/entities/tenncare/attachments/TennCareNASData2014.pdf.